SoilWorx | We deliver to the Greater Melbourne, Geelong and surrounding regional areas. We deliver to the Greater Melbourne, Geelong and surrounding regional areas. With four great locations across Melbourne - Deer Park, Pakenham, Werribee and Park Orchards, SoilWorx has your next job covered. SoilWorx services the whole of Melbourne, Geelong and surrounding regional areas, and no job is too big or too small. With our huge landscape yards, massive warehouses and expert staff, we are here to help our customers get the job done, and can deliver soil, mulch, pebbles, rock and much, much more. With our fleet of over 30 trucks, (including truck and trailers, B Doubles, and tandem tippers) and our integrated, state-of-the-art fleet management software, our transport and logistics department is second-to-none. Our GPS tracking systems allow "up to the moment" delivery location information, providing you with peace of mind and an efficient delivery, every time you order from SoilWorx. SoilWorx deliver between 7.00am and 5.00pm 6 days a week. Online orders require the delivery to be a minimum of 2 days from the date of the order. 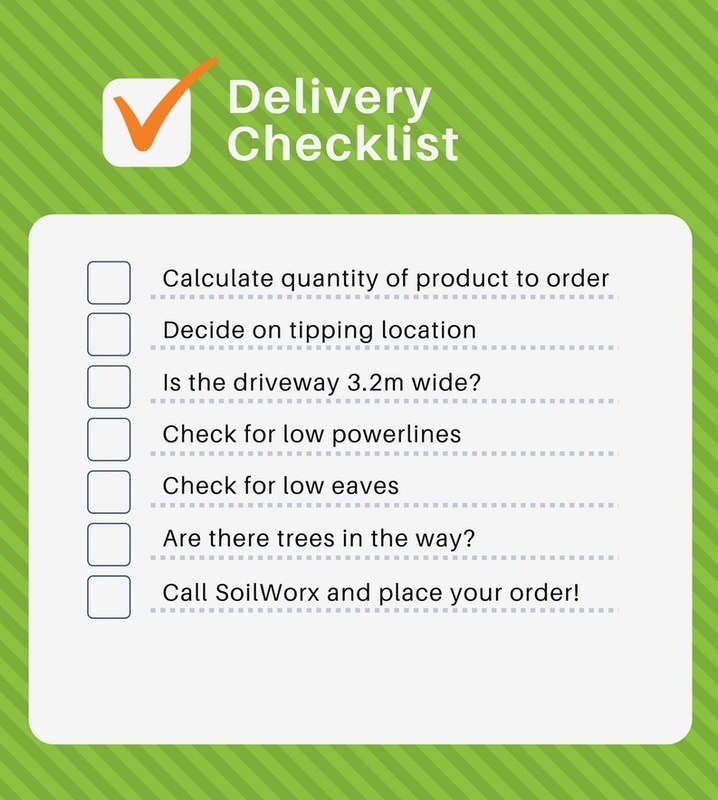 Download our delivery checklist here. How does the ‘3 for 1’ delivery work? All of our SoilWorx tipper truck fleet are equipped with split loading capabilities – this means we can deliver three bulk products, in the one delivery, with no cross-contamination of products. Can I pickup myself instead? Yes. Bring a ute, trailer or truck into one of our yards, and we can load your products for you – easy! How much bulk product can I fit on a truck? We have trucks in all shapes and sizes, from our 5m3, 8m3 and 15m3 tandem tipper trucks, to our impressive fleet of truck and trailers and B-Doubles. For volume mix options in commercial quantities please call for a quote. Do you have a minimum quantity for delivery? SoilWorx have a minimum delivery requirement for bulk products of one cubic metre (1m3) of one product. For example, you may order 1m3 of soil, 1.5m3 of mulch and 1.5m3 of pebbles, and we will happily deliver this, in one truck, for one low delivery fee (as part of our 3 for 1 Delivery Deal). There is no minimum delivery for plants, cement, edging, garden care products, bagged products and hardware, but delivery fees will apply. Is there anything you can't or won't deliver? SoilWorx have an extensive range of products, but some of them just don't travel well in our tipper trucks, or need specialised machinery to unload at the destination. This list of products is small, and consists of instant lawn, paving and retaining wall orders, letterboxes and reinforcing mesh. Of course, SoilWorx will happily arrange delivery of these products to you, direct from the supplier, but additional delivery fees may apply. Give one of our friendly Sales Experts a call on 1300 SOILWORX for further details. SoilWorx are the bulk delivery specialists, and all of our drivers and transport team are highly experienced individuals who take pride in their work. To ensure that our customers and transport staff are covered and content with every delivery we do, we encourage all of our customers to take a little time to read our Terms and Conditions of Delivery.